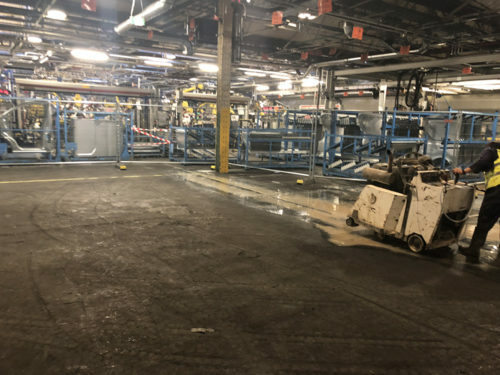 Specialists in the removal and replacement of internal or external concrete floor slabs, Level Best Concrete Flooring are really pleased to announce the commencement of the concreting contractors first floor removal and replacement project on behalf of Vauxhall Motors in Luton. The works are progressing nicely during the motor groups summer shutdown period and currently running on schedule. The industrial concrete flooring contractors site team are working around the clock to ensure programmes are either met or improved to minimise any potential downtime for the client. It may not look pretty at the minute as you can see members of the saw cutting team in the photo, but the end product will look great and allow the client the ability to use their machines without causing damage to them. If you have a damaged concrete floor you are looking to remove and replace, then please do not hesitate to call Level Best Concrete Flooring on 01405 819199. We are happy to advise and offer budget costs, especially at the feasibility stage.